Back in January 2014, Esri held the first Western Agriculture GIS Meeting in a small conference room in Esri’s regional Sacramento oﬃce. Attended by about a dozen permanent crop GIS analysts and managers, this was the first time this group had the opportunity to gather and discuss spatial approaches to the unique challenges facing western agriculture. 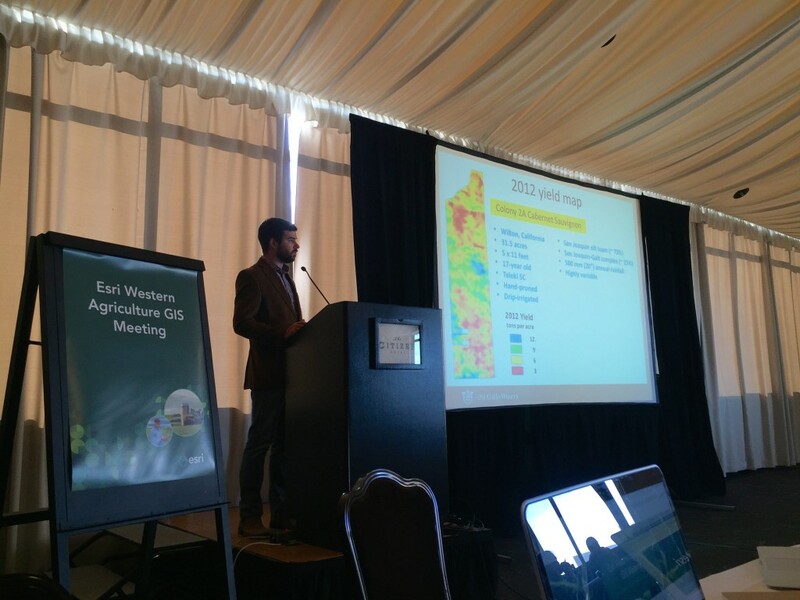 Fast Forward, by January 25th, 2016, the Esri Western Agriculture GIS Meeting has grown, attracting over seventy growers, solution providers, and academics to the Citizen Hotel in Sacramento, CA. The group came together to gather, learn from one another, and discuss the latest trends in spatial technologies for agriculture. The agenda was designed to reflect common patterns of adopting spatial technologies in the agriculture industry. The morning began with an ArcGIS platform overview, given by Esri Agriculture Lead Charlie Magruder, followed by a discussion and demo illustrating several ways to get started, map, and visualize your agricultural data. By mid-morning, the focus shifted to how to extend spatial awareness into the field, and how to collect field-based observations with Collector for ArcGIS. Attendees were each given access to a ‘Western Agriculture GIS Meeting’ portal populated with the templates that allowed them to participate in a ‘crop scouting’ Collector demonstration themselves. After lunch, the discussion opened with a presentation entitled, Mapping the Future of Agriculture by Susana Crespo. Specifically, the discussion focused on the opportunities imagery, modeling, and real-time monitoring would afford the industry. Cody Benkelman then presented on the ArcGIS Imagery Platform, as well as on new and exciting developments in ArcGIS Support for UAS. One of the biggest hits of the day was the presentation given by Elvis Takow, Esri’s resident ‘geo – viticulture – ographer’, entitled Analyzing Spatial Data Using Regression. Elvis illustrated the power of regression analysis to predict grape yield based on a number of environmental factors and conditions. GIS leaders from the industry presented on a range of topics, focused mostly on applying geography to viticulture operations. Doug Wood, Viticulture Technology Coordinator at Scheid Vineyards, oﬀered an insider’s view of how GIS is used to integrate and synthesize existing systems of record with various status updates from the field. Doug outlined the steps to successful GIS implementation, and discussed Scheid’s journey from making its first maps, to where they are today with mobile app development. Download his presentation, Viticultural Technologies: Mobile & Web GIS in Action, here. Tony Vertolli, Viticulture Technician at Constellation Brands, shared how he uses “high – revisit” aerial imagery from Esri Partner TerrAvion to monitor and analyze the spatial variability of vine health and growth throughout the season. Together with Adam Metz, Terravion Vice President, they discussed innovative ways of distilling volumes of spatially and temporally explicit data into actionable metrics, specifically through visualizing stress through NDVI, and overlaying with leaf water potential to understand patterns of problem areas. Download Tony and Adam’s presentation, Integrating Technologies in Vineyards, here. Brent Sams, Research Viticulturist at E&J Gallo Winery, shared the latest results in an on-going precision irrigation project, where mapping outcomes is helping to understand dynamics between water quantity and grape quality profiles. Download Brent’s presentation, Variable Rate Irrigation, here. Brent Sams presenting on Precision Irrigation. Edward Pultar, Geographic Information Scientist / President at Valarm spoke to the role of remote monitoring in eﬀective water and fluid resource management. Download Edward’s presentation, Water Fluid Tank Monitoring, here. Stay connected and join the conversation at the LinkedIn Esri Agriculture Group page. Here you will see announcements about our upcoming Mid West Agriculture GIS Meeting in St. Louis, MO, August 1, 2016, the day before InfoAg 2016. Speaking of the summer… you can also meet up with the Esri Agriculture Team and Community in San Diego at the Esri User Conference, June 27th – July 1st.